Large enough to handle your stuff! Trim your bike in one of these stylish tool pouches. We recommend use of a water repellant spray on all our bags for protection from rain, water and mud. Style number 1532.00 This black large motorcycle tool bag features silver tone concho,braided leather trim on fringed flap, and "D" ring keepers. Style number 1530.00 This black large plain motorcycle tool bag features silver tone concho and "D" ring keepers. 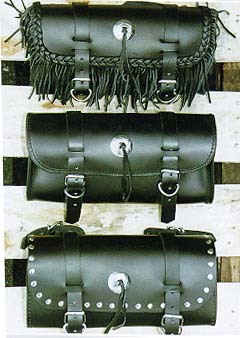 Style number 1531.00This black large motorcycle tool bag features stud trim, "D" ring keepers and silver tone concho. Sizes:13" x 6 1/2" x 4"